At the end of our version 2012 development cycle in November of 2011, I noticed a new button in Geomagic Studio: Send to SpaceClaim. I took it upon myself to become an expert with this application since Geomagic was partnered with SpaceClaim and because our products had a direct link between them. That opened an entirely new thought process for me. It seemed to me that IF there was a way to scan data, clean it up and fit analytical surfaces directly in SpaceClaim, the result would be a single-solution product for the industry I work with week in and week out. 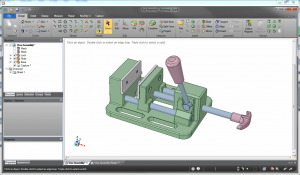 Not only was SpaceClaim gaining ground in the new direct modeling paradigm, they were leading the parade in direct modeling that other CAD vendors are scrambling to emulate but have not quite duplicated. I also noticed how extensible the application was, with strategic partners in FEA analysis, photo-realistic rendering, and computer-aided manufacturing (CAM) to name a few. It became apparent to me that this was an emerging player, and if Geomagic deepened its relationship with Spaceclaim, the dream application I was thinking of could become reality. Apparently, I wasn't alone in this thinking. In fact, I was late! Our engineering team had the wheels hitting the road even before I approached them! In one of those closed-door, if-you-repeat-any-of-this (ominously intoned) meetings, which took place in the spring/summer of 2012, I was exposed to a new project underway, a project that brought Geomagic and SpaceClaim together in one application. After that I was revitalized, re-engaged and wanting more!! Since then I've intently watched this project grow, mature and become a solid application for creating an idealized (perfect) CAD part from an otherwise imperfect, scanned manufactured part. Feeding back to the engineering team, testing, and modeling as many scans as I could get my hands on, I saw this becoming a serious contender in industry. It rekindled my passion and inner software geek to the point where in each training session I wanted to say to the customers,"You have to see this!" Well, I'm glad that moment has finally arrived. I look forward to sharing this application in my training room, using it to solve problems that were previously unapproachable, and making short work of tasks that have been traditionally difficult. This is the next generation of scan modeling with an intuitive, direct geometry interface. Gone are the days of clogged history trees, feature rebuilding and model instability. Introducing Geomagic Spark, the one application that can capture scan data, generate a CAD model, integrate into an assembly, create a drawing and integrate with a number of downstream engineering or media applications. Geomagic Spark sets a new standard. All ideas start with a spark of imagination. Here's to a product I sincerely believe will enable our customers to perform their tasks in less time with better results on a shorter learning curve than ever seen before in this industry. Geomagic Spark has arrived! Lu McCarty is a valued member of the Geomagic Team who has worked in the company's training department for over four years. He has over 20 years of engineering design and custom implementation experience.